I'm hoping someone might be able to quickly elucidate a minor issue I'm having. 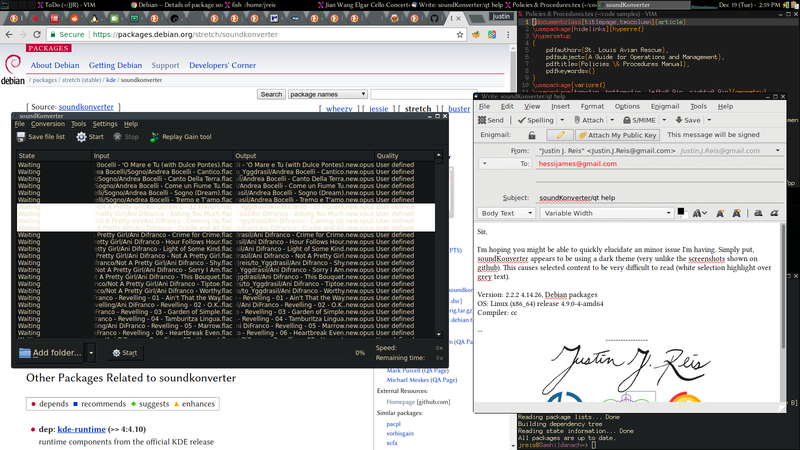 Simply put, soundKonverter appears to be using a dark theme (very unlike the screenshots shown on github). This causes selected content to be very difficult to read (white selection highlight over grey text). I'm not running KDE, in fact I'm just running a light window manager on top of X. Off the top of my head, soundKonverter might be the only QT application I've got on this machine, though I don't pay very close attention to that kind of thing so I may be mistaken. In any case, it is the only one that seems to be using these colors. There isn't much on the web (that I could find) about changing the themes/colors used by apps other than by using KDE's built in system setting GUI or a plugin for Gnome. I poked around a bit in ~/.kde and /usr/share/kd4 but nothing jumped out as an obvious lever with which to modify default theme or colors and I imagine I could get into some amount of trouble haphazardly making edits there which I'll have forgotten about by the next time I install a kde app. You are using an old Version (kde4). sorry, but i can't Help You with that. This may well be a Qt or KDE issue, or perhaps just an issue with my local config—I honestly don't know. But perhaps someone else who has installed a couple of kde/qt apps here or there on their systems will know the resolution off hand and might be willing to share. Last edited by J-Reis on December 25th, 2017, 2:39 am, edited 1 time in total. You probably need to install KDE themes. Look at the list of packages. I took a (very) quick look and saw qtcurve and a bunch of sddm-theme packages. I assume there are more. I do not know how much of KDE would need to be installed with them, but it may be the solution you are looking for. Thanks for the reply Randicus Draco Albus! As it turns out I was able to solve this problem by installing the qt4-qtconfig package (at the suggestion of user debiman on forums.debian.net). It pulled in zero additional packages (aside from itself) and weighted in at ~500kB. No bloat there! By switching from the "Desktop Settings (default)" to any of the other "GUI Styles" I was able to use the "Tune Palette" menu to specifically alter the "highlight" color. This rectified my issue without having to try to construct a good looking theme of my own. Sincerest thanks to all who thought to help!